Spent Saturday and Sunday visiting friends. Lots of fun for me, but I'll spare the online audience the details. The traveling began again Monday morning, as I headed east on US 50. I actually began well west of where 50 now ends - it used to run into downtown San Francisco, but has been truncated to Sacramento. 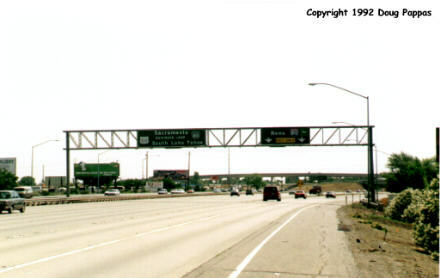 I crossed the Bay Bridge, then southeast on I-580 before turning north on SR 99, carefully following the path of US 50 between San Francisco and Sacramento. I stopped in Sacramento long enough to photograph the State Capitol and get at least a vague idea what Old Sacramento was about, then made a beeline for the Sierras. Soon after Placerville, I noticed a commotion by the side of the road and stopped to look: someone had rolled his vehicle down a 50-foot embankment and into a tree. Didn't look like anyone was seriously hurt, though I didn't go down to confirm this. As I neared Lake Tahoe, the beautiful pine trees were replaced by tacky motels and other tourist businesses, becoming denser and denser as I approached Nevada before becoming a full-fledged Casino Row just across the border. 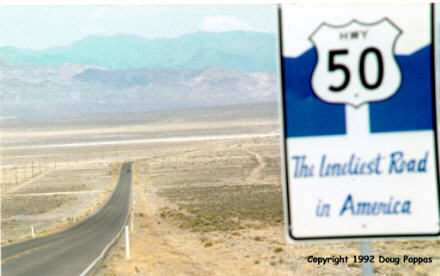 I continued through Carson City and Fallon, then across the Loneliest Road in America, US 50 between Fallon and Ely. The drive lived up to its reputation: two towns in the 270 miles between Fallon and Ely, with both combined totalling fewer than 1,000 people. After checking into an Ely motel, I wanded down to the three local casinos. One had only a handful of lousy slots, another offered odds good enough that I gladly lost $21.00, while the third had live entertainment and the worst odds of the bunch.